I joined the Newsome Ward Community Forum in 2000. When I first joined the group the meetings were quite well attended and fairly positive, it was then very much a forum to discuss local issues – however, it did sometimes seem to be dominated by paid Field Workers. It was a small team, of mainly Field Workers from this forum, who completed a successful bid to establish a 5 year Lottery Funded Healthy Living Project in Newsome – some of you may have been familiar with Newsome Next Generation, which sadly came to an end a couple of years ago. So the forum had a track record of instigating new initiatives. Soon after I joined the forum we had a change of Chair Person and the meetings started to get more and more formal, and the numbers of people joining in started to decline. I became the Vice Chair in about 2002/3, and in 2004 I became Chair Person. At the AGM before I took over as Chair Person, just 7 people attended – on 10th February this year, we had the latest AGM and there were 47 people; all full of enthusiasm. We have been on a wonderful journey over the past few years. Newsome Ward Community Forum now enables local voluntary groups, residents and field workers to come together, share information, and explore ways of working together. It helps reduce duplication, improves communication, and helps create a sense of being connected. But it hasn’t happened over night – it has been a steady evolution to get to where we are now. I hope you are wondering how we have achieved this. As I said earlier, the Newsome Ward Community Forum used to be dominated by Field Workers. I must stress that it’s not a bad thing that they are part of the meetings, but they would often unknowingly talk about things in a way that many residents couldn’t follow. The work they did would get more attention than the issues that local people wanted to discuss. So we split them up. With the help of a member of Newsome Next Generation and a Community Worker, we established the Patchworkers meetings. These were regular informal meetings where people who are paid to work in the area would get together to share information about the work they were doing. It worked really well for a few years, but with changes in staff and responsibilities, there was eventually no one to organise the meetings, so they stopped a couple of years ago. These Patchworkers meetings meant that the Newsome Ward Community Forum could focus more on engaging with residents, and the issues they wanted to focus on, and we found that over the years the number of residents and representatives from local voluntary groups, participating in the meetings have grown. We still have Community Workers attending the meetings as it is important to make sure we keep communicating with each other, we know that we need to work together to make positive things happen, but the focus of the meetings is much more informal, more inclusive and relevant to local residents. Another problem we used to have was that pockets of Newsome Ward are in areas of high deprivation, which therefore attracted additional funding opportunities. It meant that every time someone had a great idea about how they can help to take people out of poverty, improve education, build community spirit, etc – they would come to Newsome Ward. But people were accessing funding for their ideas, and trying to impose those ideas on the residents of Newsome. They often competed to work with the same groups of people, and competed for the funding to deliver their initiative. For a couple of years I made a bit of a fuss about this, I didn’t think this way of doing things was helping anyone. The Patch Workers meetings helped us to overcome this problem, it helped to improve communication among front line services and reduce the amount of duplication. And now, since the Community Forum has got stronger, people have started to consult us if they want to set up a new initiative. It means that new initiatives are created with more of an input by local people, which makes them more meaningful and gives them more chance of success. As I said the Newsome Ward Community Forum has evolved to the point it is now, and the new structure was just the beginning of that evolution, there is more. I am lucky to be part of a great team that leads the community forum, and we all have a similar drive to make our communities stronger, and more interactive. We try to remember that the main focus is about community, and the diverse interests within our communities. We still have our regular discussion groups to share information, but these meetings are now bi-monthly so as not to be too demanding on people’s time. We realise that people have lots of commitments and we value the time that they give to us and to each other. We regularly consult members on the way we structure the meetings and the content, to ensure that it meets their expectations. We try to keep the meetings light hearted and inclusive. One of the things we realised some time ago was that one of the most important parts of the meeting was the break in the middle of it – it allowed people time to catch up with each other and exchange details, so we expanded the time of the break. If people are going to give their time to us, we want them to feel that it is worth while, we want to make sure that all the people have the chance to contribute to the meeting if they wish, and that all the people who are part of the forum feel that their contributions are valued – they are all important. In addition to our regular meetings, we decided we wanted to do more community based things. We were given some funding from a youth group that was folding, and we made sure it was directed towards children and young people. One of the things we did was to establish the Kiddies Christmas Party. This was our first venture into directly delivering a community based project. We tried it out to see if people would like it, and we were overwhelmed by the response. We have now put this on for 6 years and every year we have 70 to 80 children 8 years or younger at the party, along with a parent or guardian. Soon after, we started to explore issues around community allotments, which became a lot more complex than we expected, but we persevered and it eventually led to our Growing Newsome project that you heard about from Diane earlier. We found these community based initiatives a great way to engage more people in the forum, and although numbers were growing steadily it was slow. Then about 3 years ago I met Alan Williams, and we discussed the principles of Time Banking. I really liked the idea that it could offer volunteering opportunities to people who don’t like the traditional group activity. To me it seemed a great way to help connect people within neighbourhoods to do one to one volunteering. The idea that one hour of any bodies time is as valuable as one hour of any body else’s time, is a principle that fitted well within the ethos we were creating for Newsome Ward Community Forum, and our members were willing to support the initiative. The community forum became a group member, and a willing partner to promote Time Banking. It had a slow start, as people were a little anxious that it was going to take up more of their time, and struggled to get their heads around it. However, when Rachel, our Timebanking Co-ordinator was appointed, she was able to ease their anxieties, she went out to lots of our members and was able to demonstrate how it would relate to their own group or individual circumstances – one of the great things about Time Banking is it’s flexibility. It takes time to build confidence in people to take part in any new initiative, but over the past couple of years, Time Banking has really taken off in Newsome Ward, and people now believe in it. It has helped us in Newsome Ward Community Forum to grow our membership, it has helped to engage new people in our community based projects, it has helped us to maintain a positive communication, which ensures we don’t relive some of the difficulties experienced a few years ago with duplication and competing initiatives. As you’ve heard, Growing Newsome wouldn’t be the success it is without the help of Time Banking. 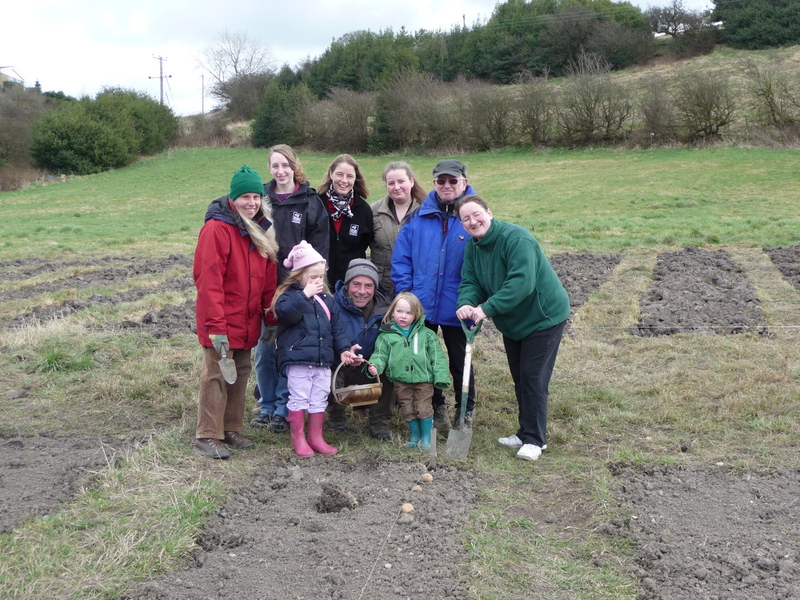 This was the best way to engage local people in community research, to get people involved in peer support for growing, to get people to help each other with their gardens, to build up a team to manage the community allotment, and more. Through Newsome Time Banking, I’ve seen new friendships develop. I’ve seen people experiencing difficulties, being helped by volunteers. It has inspired people to take more of an active role in their neighbourhoods. Rachel has been a great asset to Newsome Ward Community Forum and Time Banking has helped to develop our skill base. I’ve seen people have the courage to speak up about things that concern them and get involved in developing new projects. Our mailing list has now grown to approx 270, and growth in new members can be correlated to the introduction of Time Banking. Newsome Ward Community Forum is very different from when I started in 2000. We also have a representative on Kirklees Environment Partnership, we have a project to develop the church grounds, we have the ongoing campaign to preserve mill that you heard about earlier, we are piloting new communication systems, and we did the research to support Yorkshire Wildlife Trust to move into Stirley Farm. We have set ourselves new goals to improve things even further; to grow our membership again, to expand on the projects we’ve established. Time Banking has helped give us the confidence, and the motivated members, to take on those new challenges. I feel very lucky to be the Chair Person of Newsome Ward Community Forum, and member of Newsome Time Banking. Over the years it has been such a pleasure watching people grow into new roles. I’ve seen quite shy people blossom into leaders. I’ve seen people remember skills that they had long forgotten. I’ve seen people challenge themselves to do things they never imagined they could. The forum gives people the chance to support each other, to realise their own ambitions for their own environment or their own community. I think this is the greatest way to improve people’s physical and emotional well being.